During the harsh winter of 1777-78, the Continental Army, under the leadership of General George Washington, was kept at an encampment in Valley Forge, Pennsylvania. Valley Forge served as the perfect location for the encampment, as it was on top of a hill and had proximity to Philadelphia, giving the opportunity for espionage. Soldiers at Valley Forge were subject to brutal conditions, which resulted the deaths of over 2,500 of Washington’s troops. Contrary to popular belief, there was no battle during this time. Not a single shot was fired at Valley Forge. Visitors to Valley Forge today start at the Visitor Center, opened in 1976 for the Bicentennial of the Declaration of Independence. A statue of George Washington on his horse greets visitors at the entrance. The Visitor Center has a small museum with artifacts dating from the Revolutionary War, and plenty of information about the history leading up to the Revolution, as well as the lives of those who stayed the winter. It also has a cafe and a large gift shop. Nearby, a small theater shows an 18-minute introductory film. From the Visitor Center, visitors can follow a specific route around the park, which is best driven, although it can be walked. 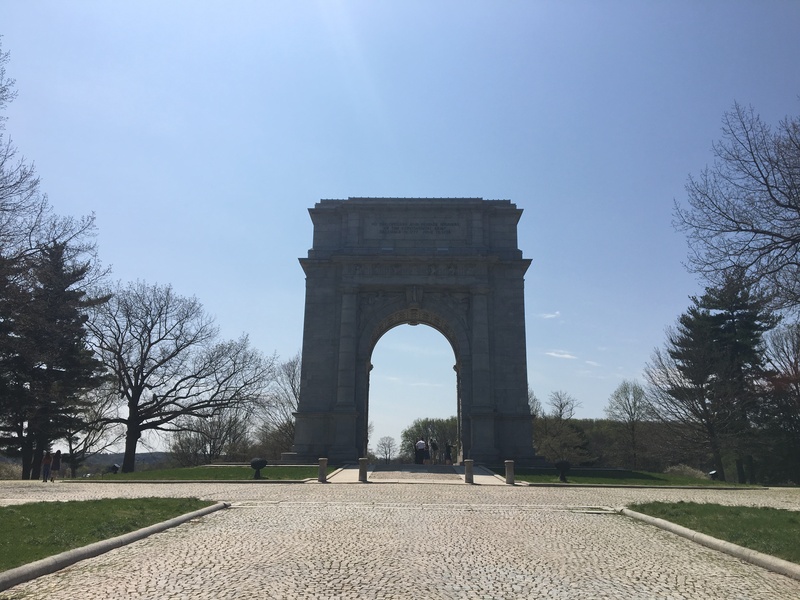 Valley Forge has 26 miles of hiking trail, which extends to most of the historic sites, including the National Memorial Arch, the Muhlenberg Brigade, and Washington Chapel. For those who choose to drive, there is parking available at the Muhlenberg Brigade, the National Memorial Arch, Washington’s Headquarters, and the Washington Memorial Chapel. 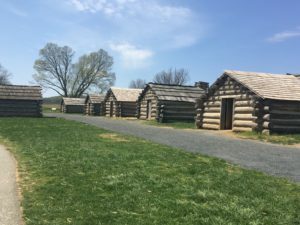 The tour begins at Muhlenberg Brigade, which has log cabins reminiscent of those that soldiers lived in during the winter. They are reconstructions, although they are very accurate to the originals. A dozen soldiers lived in each cabin, and several of them are accessible to visitors, showing the conditions of the soldiers. There are also a few cannons nearby. Further down the road is the National Memorial Arch, a triumphal arch akin to those of Ancient Rome. It was dedicated in 1917 as a monument to American soldiers throughout time who gave their lives to defend the United States. It is a grand Neo-Classical structure, with the names of generals inscribed on the interior walls. Quotes from Washington about the vitality of his soldiers are inscribed on either side. The arch is also a prominent landmark, visible from throughout the park. After a long and scenic drive, visitors will reach Washington’s Headquarters, one of the few authentic buildings in the park, built in 1773. This two-story stone building was once, as the name would infer, George Washington’s Headquarters, as well as his residence while at Valley Forge. Martha Washington lived here during the winter as well. Prior to that, it had been the house of a Quaker miller named Isaac Potts. The rooms of the house, including Washington’s office, have been reconstructed. Nearby is Valley Forge Station, a train station that was once part of the Reading Railroad. The tour concludes at Washington Memorial Chapel, a lovely Gothic chapel with deep-blue stained glass windows. They depict figures of the Revolution, including George Washington, Martha Washington, Alexander Hamilton, and “Mad” Anthony Wayne. It functions as an Episcopal church, the denomination that Washington belonged to. The sanctuary is impressively sculpted, and has extremely elaborate furnishings. There is a nearby cloister, with a statue of a grieving mother. At the base of the bell tower is the Justice Bell, a traveling symbol of the Women’s Rights Movement that found a home in Valley Forge in 1943. Like the other sites operated by the National Park Service, admission is free. Washington Memorial Chapel asks for a donation, as it is likely in need of repairs. Get onto the Vine Street Expressway facing west, and transfer north (toward the Art Museum) onto Route 76. Continue on this road through Fairmount Park, Manayunk, and out of the city. Get off 76 at exit 327 B, at the famous King of Prussia Mall. Turn right onto Mall Boulevard and make another right onto Gulph Road. Continue until you reach Outer Lane Drive, and make a left. Follow until you reach the Valley Forge Visitor Center, where there is sufficient parking.